Fifteenth Century Castillo de Chinchón, destroyed 1520, later reconstructed. Anyone want a fixer-upper? Daughter reading a sign in Spanish that said, "Do not stand on this bridge." You can only read the sign if you are on the bridge. The mote beneath is dry, deep and deadly. Medieval buildings with swaying photo facade, with reconstruction behind. 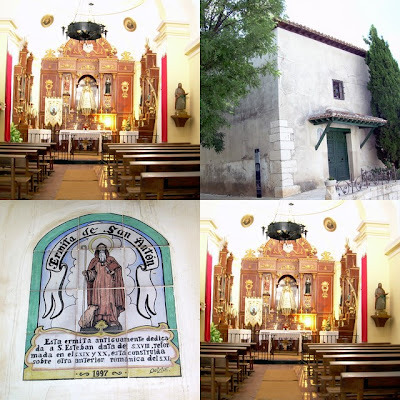 Hermitage of San Anton. I had to stick my camera through a hole in the door to get the interior shot, as the Hermitage was locked and dark inside. The Spanish people are wonderful and live up to their reputation of loving children but the food is horrible. I was quite squeamish about discovering a baby hoof and later a tiny tail on my pork. I am ashamed to say but when we took a trip into Madrid, Tall Husband and I sneaked into an American fast-food place and had hamburgers and fries. Now we will probably get mad cow disease. My first day in Chinchón, standing in the center of Plaza Mayor (where they have the running of the bulls and all other public events), I felt dizzy. My vision seemed to be playing tricks on me. On closer inspection, though, I discovered that the entire facade of the three-story medieval buildings surrounding the plaza was hidden by a realistic giant cloth photo that was gently waving in the breeze, giving the appearance of swaying buildings. The gigantic, panoramic shot was their after photo of the plaza. It seemed the entire town was under construction. We all were sharing a wonderful medieval (updated of course) apartment on the Plaza Mayor but the constant rat-a-tat-tat of the jack hammers against the apartments stone wall frazzled our nerves. 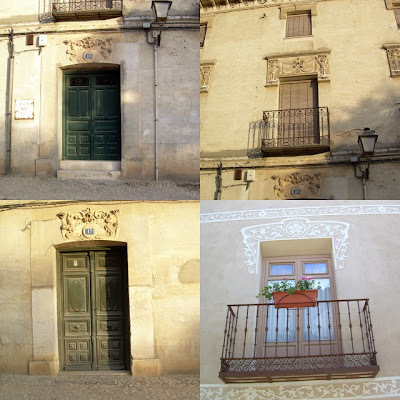 Tall Husband and I moved to the much quieter Hotel Condesa de Chinchón, just down the street. If you stood in Chinchón's Plaza Mayor long enough, you would meet just about everyone in the world. We met people from all over the planet. An Italian bicycle team came through, as did a middle-aged French motorcycle gang. Sorry Kids. This summer we are staying put and eating our own wonderful cooking in The Bunny Bungalow. There's room for everyone and we promise not to jack hammer the walls. Of course, we'll miss those Italian guys in their tight little bicycle pants and those French women in their high heels on their Harley bikes. Sounds like a charming town! I totally agree with you about the Spanish food. Terrible! My only consolation was the sherry and tapas--especially the fantastic olives they usually serve.